Hi guys, I was up in the big city yesterday! It was the annual Carers Scotland conference so up I went with 3 other Carers. To be fair it was a real cold, frosty day but my gosh it was so cold inside the building the speakers put their gloves back on! Thank God at the break time there was some warming soup! Suitably warmed from the soup, it was easier to listen to what was on offer as there was a speaker from TUNSTALL. This company offer some help to support people living in their own homes for as long as they can. Well, you might ask, what's so different about that? Well, the solutions are all using Technology! you know, alarms and sensors and fancy pill boxes that let you know when it's time for meds. I was quite impressed with some of their gizmos and gadgets so I'm going to have a looky-see for myself on there website. Once we'd tried out some equipment and heard what Carers Scotland had been up to for the last year, it was time for some...pampering! I had the choice of either going for a massage or trying some art therapy. You know me, I'll try anything once - well almost anything!LOL so I decided on the art therapy and it was BRILLIANT! It's so much fun and it's relaxing and best of all...you get something to take home at the end of it! I bet you're wondering what I painted....picture window, fancy urn....large vase? Well it was an enjoyable pass time I'd kinda like doing again so who knows, they say practice makes perfect! 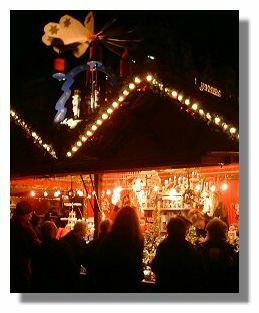 On the way home, there was a German Market set up in the town! It was just getting dark at this point and everything looked so pretty all lit up. Anyways, Coo was fine while I was out, he and Looby spend a wee while in the park and went for a coffee! I'm glad I went as I needed a bit of a break,the last few nights have been a bit hard going as Coo has a cold and we all know what that means - hard hat and flap jacket time! Next up is our panto visit on Saturday, I hope I can keep Coo awake! I think he'll be fine as in 'Pantoland' there's usually a lot of shouting and singing so even he would find it hard to sleep, well you'd think so, anyway here's hoping! I'm glad you enjoyed your Glasgow trip. I want to see a picture of you in your new hat. Any chance? Carers and Christmas, What did I buy you..?